Valentine's Day is just one week away! Keep your lips kissable with these lip products. Love Balm ($15) by Jurlique is a skin salve made with Vitamin E, Olive, Soybean and Safflower Oil and scented with Tangerine oil. 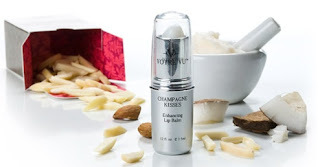 It can be used to apply to lips , elbows and hands to moisturize, soften and protect dry or chapped skin. For the month of February, you can actually get Love Balm for $9 at jurlique.com when you enter LOVEME at checkout! Champagne Kisses Enhancing Lip Balm ($29) by Votre Vu is a lip enhancer that soothes, nourishes hydrates and heals with sweet almond oil, coconut oil and shea butter. These ingredients make for a delicious, natural flavor. Daily use may help minimize the appearance of fine lines and help prevent lipstick from bleeding and feathering. I have been toting this balm around for weeks, applying it a few times a day and also use it as a base before applying lipstick or lip gloss. 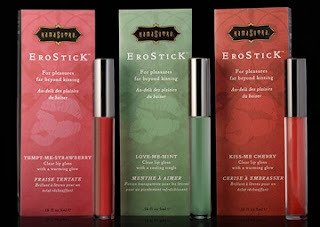 EroSticK™ ($15.99) by Kama Sutra is a clear lip gloss meant for pleasures far beyond kissing. It is specially formulated to accentuate your pout with a luminous shine, a deliciously kissable flavor and exciting sensations. This lip polish comes in three flavors - Kiss-Me-Cherry and Tempt-Me-Strawberries, both with a warming glow and Love-Me-Mint with a cooling tingle. I can't say I've tried this yet but I am intrigued!